I'm a film and television director, editor and writer. My works include the feature film "Os xeretas" (aka X kids), the drama-series "9mm São Paulo" (Fox Television), a children's series, "Disney Cruj" (Disney Channel and SBT network), and 5 short-subject films. "Invaders from Mars" is my first released book and it is part of a series of stories inspired by authors such as João Carlos Marinho ("The criminal mastermind"/O gênio do crime), the children's book-series of the 70's called "Firefly Collection" (Coleção Vagalume), and many classics of youth literature. 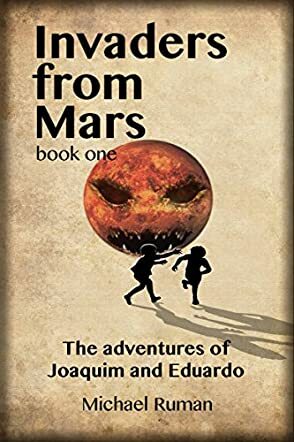 Invaders from Mars: The Adventures of Joaquim and Eduardo by Michael Ruman is a children's adventure tale that follows the strange and mysterious life of 11-year-old Joaquim and his best friend Eduardo. The story begins in 1969 with Joaquim certain of an alien invasion of Earth. But Eduardo is less convinced of the Martians' plans, so the two boys begin an adventure to find clues of aliens on Earth. The boys unwittingly stumble upon a real invasion plan of Earth and it is up to them to stop Sergeant Gomes and the rest of Earth's enemies. Can the boys stop the Martian invasion? Or will the aliens prove too strong to let a complex invasion plan be foiled by two preteen boys? One thing that readers will appreciate about this story is the simplistic nature of this book. Because the setting is 1969, readers are thrust into a world without cell phones or video games or iPods, or any other electronic device. This was a refreshing aspect of the story. The main characters must use deductive reasoning to discover the truth about the alien invasion and can't rely on the Internet to solve their problems for them. This is a fun, cute mystery, with a lot of interesting clues that kids will really appreciate and understand. Parents can also be happy with the message of this story and feel good that their children are reading a nice, clean story that is educational as well as entertaining. I appreciate your review and thank you for realizing it's actually clean and clear for children and their parents. Since you wrote such an interesting review of Invaders From Mars, a book that I translated, I wonder if you may email me to talk about the review of other books and authors I have translated into English: if you have any interest, my email address is joaorosaun@uol.com.br.